RETHINKING OUR NOTION OF JUSTICE through the history of slavery is an appealing project, not least because it foregrounds what theories too easily forget: the agonies and abuses the most disadvantaged among us suffer. But it should also raise some concerns: about history, about human rights, and about justice. History. The history of slavery does not narrate itself. We can all be shocked by the same images of violence, and we can all react with comparable levels of indignation in the face of racial exploitation. But the interpretive and theoretical nature of Johnson’s project will require the use of other intellectual means and tools that make it subject to close scrutiny and critique. 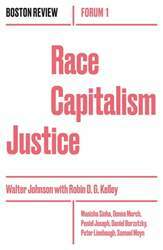 Walter Johnson, Harvard historian and author of the acclaimed River of Dark Dreams, urges us to embrace a vision of justice attentive to the history of slavery—not through the lens of human rights, but instead through an honest accounting of how slavery was the foundation of capitalism, a legacy that continues to afflict people of color and the poor. Inspired by Cedric J. Robinson’s work on racial capitalism, as well as Black Lives Matter and its forebears—including the black radical tradition, the Black Panthers, South African anti-apartheid struggles, and organized labor—contributors to this volume offer a critical handbook to racial justice in the age of Trump. The Gong of History; Or, What Is a Human?